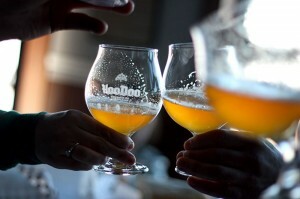 Join us for our newest beer release that’s slated for this week. On Thursday, February 27 we will tap the HooDoo Tripel – a big, belgian beer that is sure to delight local beer fans. We will tap the first keg at 5:30pm in the Taproom. 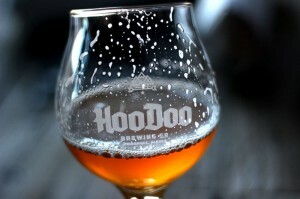 HooDoo Tripel is a strong, effervescent ale brewed in the Belgian tradition. One of the strongest styles of Belgian beer, Tripel is deceiving in its light color, and inviting in its aroma and candy-like sweetness. Made with only the finest european malts, fermentable sugars are also derived from an addition of Belgian Candi Sugar during the boil. This sugar addition results in not only a higher alcohol content, but also allows the yeast to ferment the beer to a high degree leaving a clean, dry finish. Flavors from the yeast and malts compliment each other with peppery, fruity flavors dominating, and an occasional hint of bubblegum.